With a title that sounds like a b-side from the late David Bowie, the S&G reflects upon the too-few attempts to portray World War 1 in the air on the silver screen. In many ways it is a tragedy that stories of the young pilots in peril during World War 1 have not received as much of the high quality of storytelling as their counterparts in the trenches. Perhaps it is the lack of poetry. Perhaps it the combined legacy of Biggles, Snoopy and Captain Flashheart that serious depictions of the airmen of the great war are so few and far between. Whatever it is that has caused this massive gap in popular culture is utterly and fundamentally wrong-headed. Here endeth the lesson, now let’s watch some aeroplanes and dream of the day that Peter Jackson actually gets on with making the ultimate cinematic tribute. Grand-daddy of them all is Howard Hughes’s movie Wings (1927), featuring a whole lot of veteran pilots flying war surplus aircraft. Even then, genuine machinery was becoming hard to come by and one could never mistake California for Passchendaele in a million years but enough about this epic film was authentic in a way that nobody since would ever attempt to match. The advent of World War 2 somewhat stifled demand for movies about World War 1. Not until the 1960s was there another blockbuster about flying over the Western Front and it came in the form of The Blue Max (1966), starring George Peppard. As with Wings, the aerial sequences were filmed for real, with just enough authentic-looking replicas of Fokker Dr.Is, Fokker D.VIIs, Pfalz D.IIIs and S.E.5as to conceal the makeweight Tiger Moth contingent in the rear. The back screen projection for the actors’ close-ups look rather quaint in this day and age but it was a stronger film than it receives credit for. George Roy Hill went out of his way to celebrate the World War 1 airman in war, in peace and most importantly in popular culture while, at the same time, the British took a very different approach. The movie Dawn Patrol (1975) and the BBC TV series Wings (1976-77) attempted to tell the story of the air war as sneering social commentary. Both appear to have been written by North London socialists in penance for Britain’s imperial past. Jeremy Corbyn probably has the DVD box set of Wings in pride of place on his Soviet-era wall units. Ghastly. After decades of silence about biplanes (and triplanes) over the Western Front, in came Hollywood with a bright young star, James Franco. Predictably, this is a tale of how Americans tried to win the war before Woodrow Wilson had got under starter’s orders. Flyboys (2006) was loosely based on the story of the Escadrille Lafayette in 1916-17 and is actually a good deal less infuriating than it might have been – although the speed of the CGI Nieuports and Fokkers seems to owe more to Star Wars than to The Blue Max. And finally we have the slightly poetic violence portrayed in The Red Baron (2008) – a German movie filmed in English to try and maximise the international audience. There is an awful lot to commend this one, but despite being a veritable feast for the eyes it’s all a bit flat with no edges whatsoever, turning the real-life Red Baron into something of a gauzy nonentity. There are moments of beauty that the PlayStation graphics of Hollywood would have overlooked but, oddly, if I were trying to conjure up some enthusiasm for World War 1 flying in someone without much exposure to it, I’d play something else. This film just isn’t quite as good as it could have been, in the same way that Flyboys isn’t as bad as it should have been. The S&G’s ears are still ringing after catching Gary Numan on his ‘intimate’ tour of the UK – playing a succession of small venues to stay fresh ahead of his appearances at some of the major rock festivals of the summer. Quite apart from the evening entertainment was the opportunity for the S&G to sit down for a natter with the man himself. After chatting with the dedicated Numan fans (Numanoids no longer!) 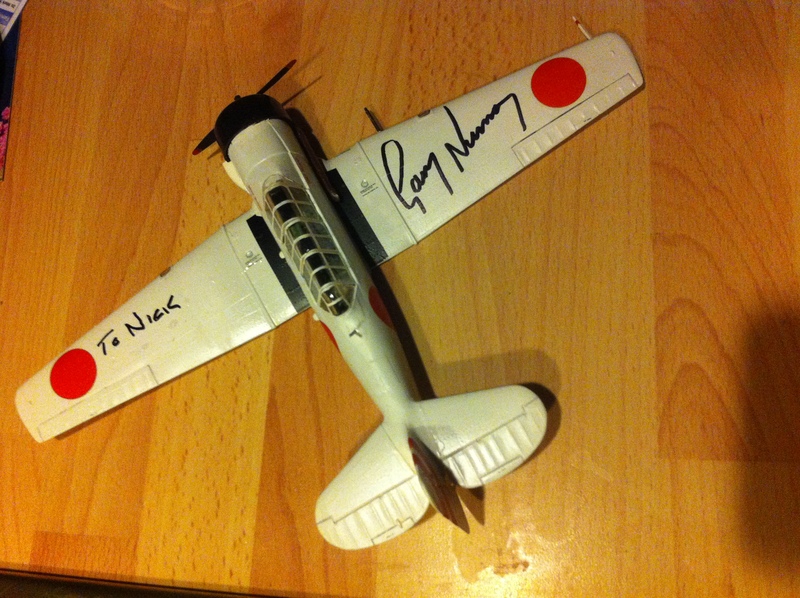 he very graciously signed the latest addition to the office aircraft collection – a model of the AT-6 Harvard that Gary flew so spectacularly at airshows in the 1980s-1990s. 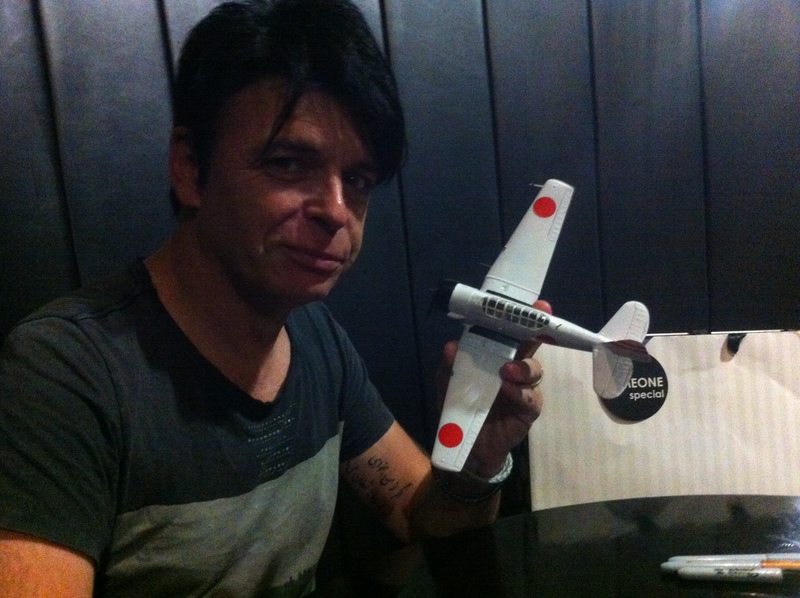 It might perhaps seem a trifle odd to sit down with a rock star with a model aeroplane and proceed to talk about little else but flying – but not Numan. It’s a subject he loves. 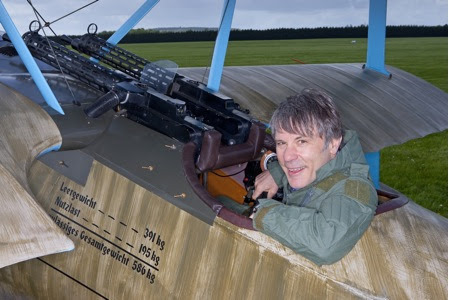 He was particularly tickled to hear that Iron Maiden frontman Bruce Dickinson had bought a replica Fokker Dr.I triplane and intended to fly it over the Sonisphere festival at Knebworth – where Numan and his band were also due to play. It’s now almost two decades now since Gary Numan flew at air shows. “I still really miss it,” he conceded to the S&G, holding the little plastic version of his Harvard. He talked proudly (and not a little jealously), about his brother, John – a former band member who went on to become a commercial pilot and now instructs EasyJet captains. Apparently they both still fantasise about living a free-wheeling life flying cargo around the world. Possibly in a pair of Dakotas. Meanwhile back in the world of rock and pop, Numan is still the consumate showman and delivered a two hour set with relish – leaving the S&G among the rest of the deaf, dazed and happy punters. On July 7 he released a new single, I Am Dust, available for 99p on Amazon, iTunes and wherever else singles are sold these days – and his loyal fanbase is doing its utmost to celebrate 35 years since his debut Number 1 with a return to the top of the charts – so feel free to join in. Buy your copy before July 13 and let’s see where it gets to. After all, Gary Numan is one of the world’s good guys. Peter Jackson copped some flak from Richard Todd yesterday, but although remaking The Dam-Busters is never going to be easy, there’s still plenty of grounds for optimism. After all, The Lord of the Rings trilogy is fantastic. As is The Hobbit. OK, a bit too much James Nesbitt for some tastes, but I think in time many people will end up preferring it to LOTR. Not only that but this is a man who seriously loves aircraft and history. He’s invested millions in building a museum full of World War 1 artefacts and restoring or building 100% authentic ‘continuation’ examples of World War 1 aircraft that are flown for the public. 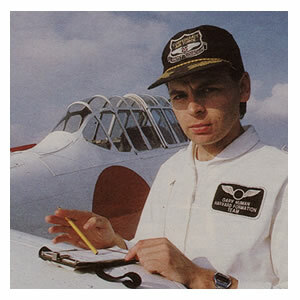 And as a little extra side dish, he funded the creation of Wingnut Wings – making the highest quality model kits on the market. Truly, this is a god amongst men. So for your entertainment, here’s Jackson’s little experimental short film made using some of his World War 1 aircraft. Perhaps we can look forward to him doing his own Waldo Pepper-like movie before too long? If you want movies about aircraft done properly, better get a pilot to make them. That’s why The Great Waldo Pepper is such a joy – because it was the work of George Roy Hill. A feisty presence in the Hollywood firmament, Hill was something of an outsider among the great and the good of La-La-Land. As a child inthe 1920s and 1930s he idolised the great fighter pilots of World War 1, and when war broke out once again he enlisted as a pilot – flying a cargo aircraft around the Pacific in WW2, but becoming a nightfighter ‘ace’ in the Korean war. Upon leaving the military, Hill worked as a journalist and then took an interest in theatre. He moved quickly to television and then on to making movies, with his debut coming in a 1962 adaptation of A Period of Adjustment by Tennessee Willams. An up-and-down career then hit paydirt with A Thoroughly Modern Millie starring Julie Andrews, which was followed by his best-loved hit: Butch Cassidy and the Sundance Kid. The leading men on Butch and Sundance, Paul Newman and Robert Redford, soon learned not to fall foul of their tempestuous director’s strong work ethic. Late arrival on set would see guilty parties strapped in to Hill’s 1930 Waco biplane and subjected to a bracing aerobatic flight. It was Newman’s co-star, Robert Redford, with whom Hill’s other enduring successes were achieved. First came The Great Gatsby and then probably the most personal film of Hill’s career in the form of The Great Waldo Pepper, a paean to the barnstorming days of the 1920s aviation boom in which Redford plays a charming, roguish pilot who saw too little of World War 1 but tells a good tale and trades on his matinee idol looks to good effect.